Mu: Age of Adventure — A look at the scharr! Hey there! Nick here as usual, and this Monday I wanted to give a brief overview of another of the playable species in Mu – this time the burly, aquatic scharr. Standing a full head and shoulders taller than a human on average, the scharr are an immense, muscle bound amphibian species. 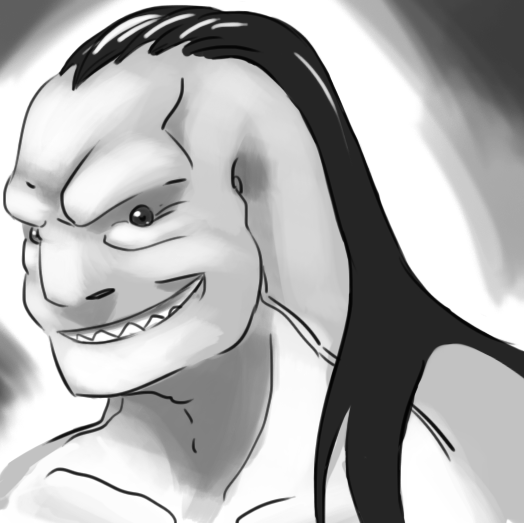 While roughly humanoid in appearance, their faces are streamlined and simplified with broad chins and foreheads, flat almost non-existent noses, and small, beady, shark like eyes set in shallow sockets. They lack eyebrows and body hair in general, but do have a small patch on their heads that is straight and wiry and often worn long. Their skin is smooth and tough, much like a shark’s, and ranges from light blue to muddy red. Scharr have much sharper teeth than humans, and their diets are almost entirely fish but a variety of seaweed based dishes compliment their largely carnivorous meals. Scharr display very muted sexual dimorphism and the men and women very closely resemble one another, with the men being on average slightly larger. Their most unique physiological difference however is their lateral system. Special sensory nerves line the sides of their bodies allowing them to sense minute water pressure differences and electromagnetic signals over short distances while in the water. Most scharr live on the large archipelago chain that starts at the mouth of the Pelakos Sea, where its equatorial climate and warm waters can keep their semi-cold blood active. It is on this island chain that the two great scharr empires live. The Southern Imperial kingdom, which resides on the tail end of the archipelago and maintains a vast empire of colonies along the Broken Coast of the southern continent where they control a great deal of iron mines. The other being the Divine Empire, which while it maintains fewer of the islands than the Southern Imperial kingdom, controls the waters in around around the mouth of the Pelakos Sea. This gives them a tremendous amount of control over many trade routes. So much that despite the Divine Empire’s small size, they are one of the wealthiest nations in the known world. Both empires are feudal in nature, and have a rigid social hierarchy. Marriages are seen as being solely political, and marriage for love is an awkward concept many scharr don’t quite understand. Many of the smaller islands function as vassal states of the larger, chaining back to the capital islands of both empires. While fealty is considered exceptionally important in both empires, this functions as somewhat of a double edged sword in cases of political consolidations or annexation. Often when islands are annexed the populace retains fierce loyalty to their previous lord, with disdain for the new lord goes as far as to create vast numbers of self-imposed exiles. This has lead to a great deal of scharr diaspora making their way into the surrounding nations. Many infamous scharr pirates have their origins as self-imposed exiles during bloody annexations. 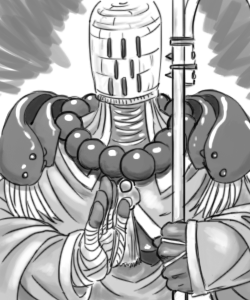 These exiles often still fly old banners of dispossessed lords and nobles in a sign of undying loyalty to their lord and burning hatred towards those who dispossessed them. Many of these exiles who don’t turn to piracy however find great success as adventurers. Their size and strength make them imposing comrades and the world renowned Great Wall bodyguards from the Southern Imperial Kingdom are always able to find work. The scharr languages are deep and resounding, to match the extremely low registers needed to project words underwater, and as such their words and by extension names are exceptionally difficult for the other intelligent species to pronounce. Most scharr use loan names when dealing with others, but will try to get close friends to learn how to pronounce their actual names as a sign of respect. The scharr are loyal and strong companions, ready to jump to the aid of their smaller companions. That’s it for for this Monday, but come back next week for Mu: Age of Adventure beta rules 1.1! We’ll have some updated formatting, some new background, and hopefully some new art for the rules! See you then!